Navdy is a rather clever idea. The device is about the size of a paperback book and is placed on the dashboard behind the steering wheel. It connects to the car's data via the OBDII port (which was mandated on all cars in 1996) and connects to a smartphone via bluetooth. Data is projected on its 5.1" transparent display and appears as if it is out in front of the car (around 6 feet in front of the driver) so that you don't have to take your eyes off the road. Navdy can display all kinds of information. Vehicle information, such as current speed, RPM, fuel economy, tire pressure warnings and more is readily available. What's more impressive is that smartphone functions are integrated as well. No longer do you have to look at your phone screen for turn-by-turn directions or to see who's calling or texting. Navdy can display that information directly in front of you. 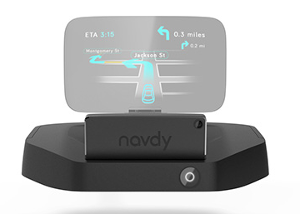 Navdy has voice and gesture recognition. By simply waving your fingers (swipe left, right or thumbs up), you can answer calls, end calls, send text messages, etc. In addition, Navdy works with the voice recognition systems for Apple and Android (Siri and Google Now). Navdy is also able to play music from your phone (Pandora, Spotify, iTunes and Google Music). The music can be sent to the car's stereo via bluetooth or through an audio-out jack on Navdy. The Navdy crew is currently building apps that will run on Navdy and plans on opening up to development partners in the future. I have to say, of all the cool devices that I've seen, this is on my "Must Have" list.